Sexual violence is a public health crisis of epidemic proportions. More people are talking about sexual violence and seeking help than ever before. Sexual assault centres are struggling to meet the needs of Albertans. Last year new counselling clients increased by an average of 53% across the province – and that was before the massive #MeToo movement. This is a positive development, yet requires immediate action to meet the growing need for services. Sexual assault service providers in Alberta need more funding to address this public health crisis. AASAS and its member agencies provide services that are: identifiable specifically as “sexual assault” services; specialized; evidence based; offered to survivors as well as their support networks; provided by qualified professionals to survivors of all gender identities; and accessible across the life span. This continuum of services includes: service coordination and collaboration, crisis intervention, counselling, education, outreach, volunteer support, and police and court support. Together these service areas provide a seamless and coordinated response to sexual violence. Write to your MLA and urge them to support additional funding to sexual assault centres in Alberta. Share! Post on Facebook, Twitter and Instagram the need for increased financial support for specialized sexual assault centres. 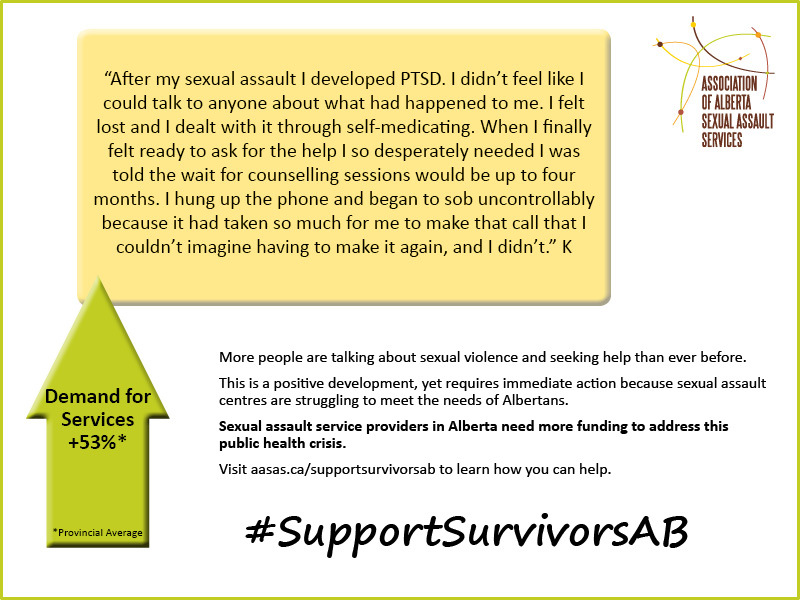 Use the hashtags #SupportSurvivorsAB and #ABLeg.